It’s pie season! 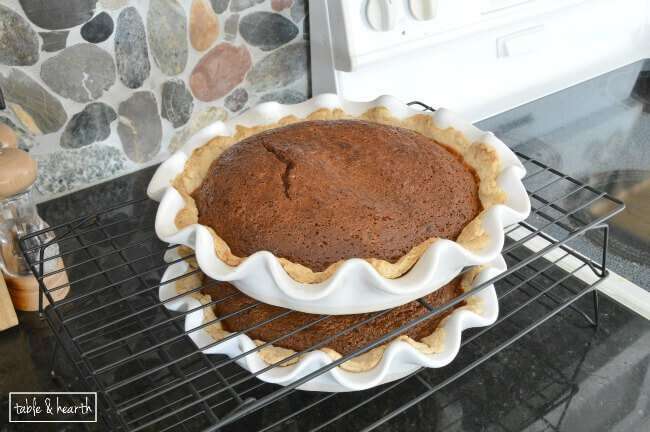 So today I’m sharing one of my favorite recipes for Wayfair’s Battle of the Pies! I’ve loved the Four and Twenty Blackbirds Salted Honey Pie recipe for a while now but I’ve always wanted to play around with it too. What better excuse to finally do so when you’re asked to take part in a virtual pie bake off?? 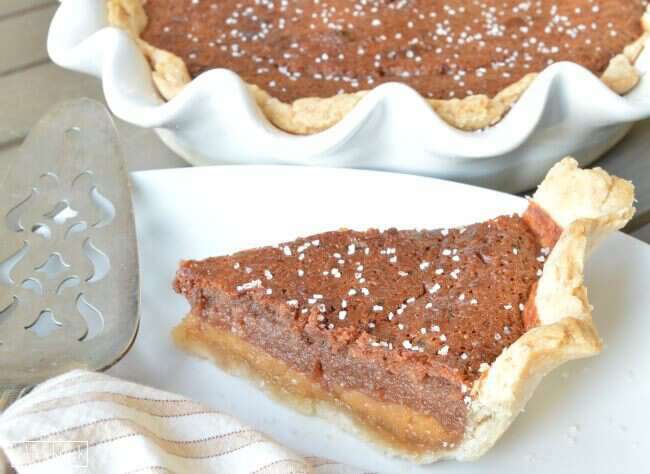 I browned the butter and added just a little bit of chocolate to the original recipe to make this Chocolate Salted Honey Pie, and I must say, I love it even more now! 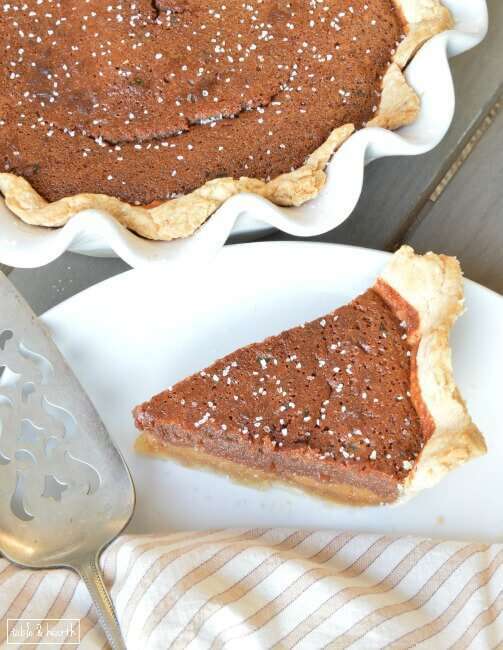 The original recipe is found in the Four & Twenty Blackbirds Pie Book and is similar to a chess pie (also a personal favorite). You can of course use a ready-made pie crust but I really need to practice making them from scratch so I chose to do a homemade crust (I always use the basic Flaky Pie Crust from Joy of Cooking.) Now, they aren’t the most beautiful crusts yet by any means, but they taste pretty dang good and that’s all that really counts, right? Once you have your crusts in the pan and chilling you’ll make the filling. It’s super easy and quick. First, if you want to brown your butter, do that (see this post for how browning butter works.) You can use regular melted butter if you’re short on time though. 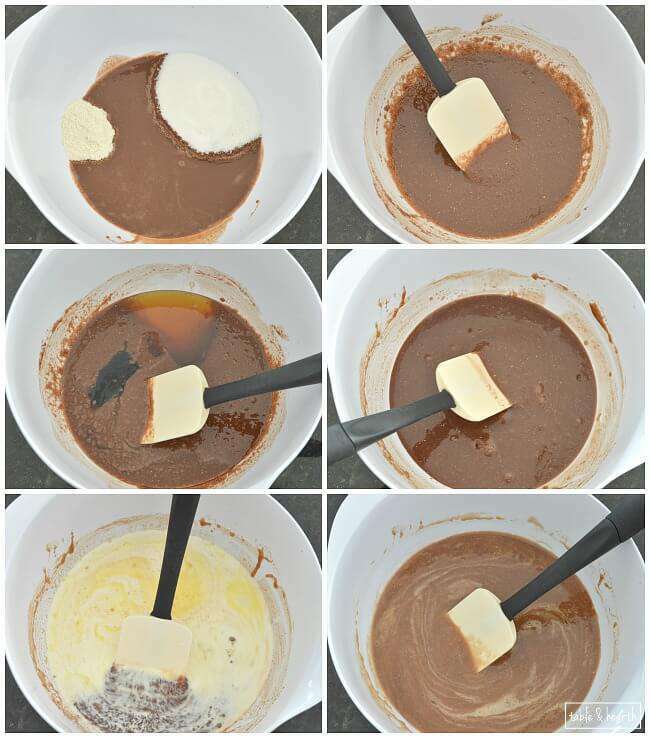 Add the broken chocolate chunks to your finished butter while it’s hot and mix until they’re fully melted. The butter, sugar, cornmeal, and salt gets mixed together until combined and then the honey, vinegar, and vanilla paste is added. The mixture will get kind of gummy and stretchy when it’s mixed well. Then, the whisked eggs and cream gets folded in (be patient, this takes a few minutes) and your filling is ready! Pour it into your crust, cover the edges with a pie shield if you have one (you can use foil too), and then bake. It’ll come out all puffy and beautifully golden (yes, I made two!). Once the pie has fully cooled, sprinkle the top with sea salt to your liking, but don’t be shy…the salt is the best part of the pie! 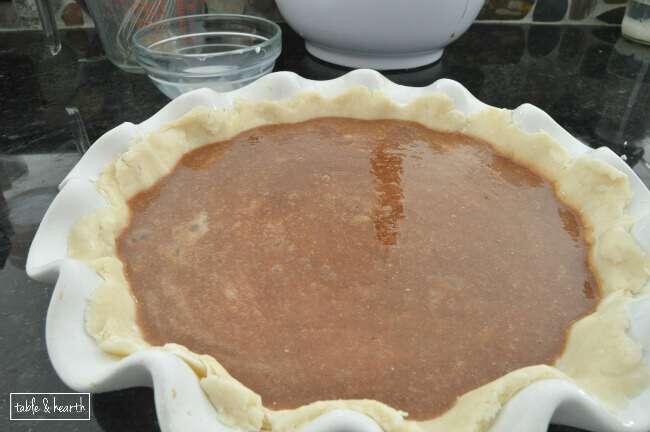 Prepare pie crust and place in pie dish. Refrigerate until ready to fill. Brown the butter. One finished, place the chocolate chunks in the hot butter and mix until completely melted. 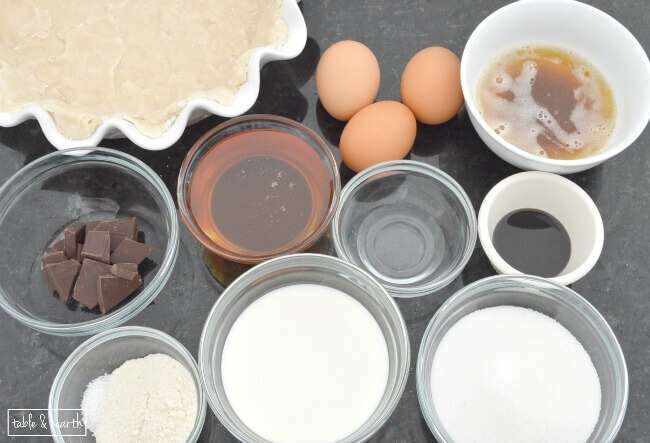 In medium bowl, combine sugar, butter/chocolate mixture, salt and cornmeal and mix until combined. Add honey, vanilla paste, and vinegar and mix until combined. Whisk the eggs in a separate small bowl, then add to mixture along with cream. Fold gently until combined. Pour into pie crust and attach pie shields if you have them. Use foil if needed. Bake on the lower oven rack for 40 mins. Move to middle rack, remove shields, and bake an additional 20 mins. Filling should puff up and be slightly wobbly in the center when done. Let cool for an hour, then sprinkle with sea salt as desired. You can use regular, non-browned butter if desired. You can add more or less chocolate, depending on your taste. Thanks so much to Wayfair for challenging us to the bake off!! Any excuse to make a pie :) Check out the other entries by searching #WayfairPieBakeOff on Instagram, Twitter, and Pinterest! That sounds delicious, Emily! I love salted desserts, the salt really brings out the other flavors. Pinning! This looks amazing! I love salted anything, so this recipe is a must try! So happy to have you over here, thank you SO much!!! Holy cow, this looks good!! 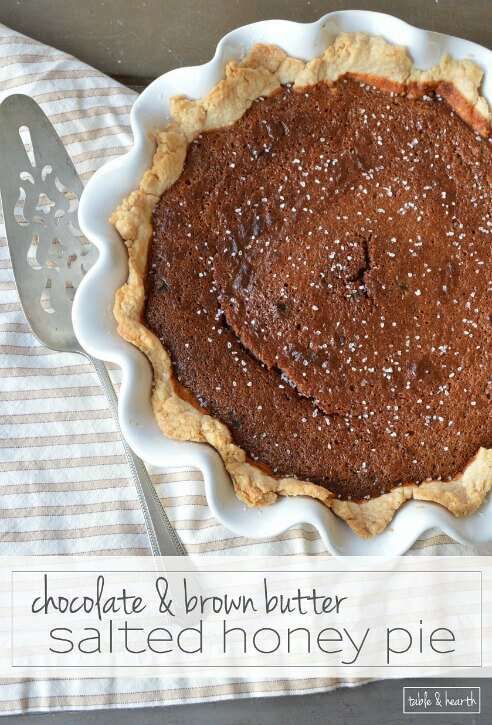 I’m not a fan of traditional pies, but chocolate & salt I love! Honestly, I’m not either Roxanne! Fruit pies just never sound that great to me, but buttermilk, chocolate, or honey? Yes please! Emily, this looks divine! Salted anything and I’m there. 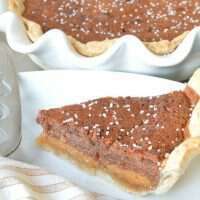 This would be a delicious twist on the ever-loved, but predictable pie favors that accompany the Thanksgiving season. Can’t wait to try it out! This looks amazing! I love salted desserts too. It would be perfect for Thanksgiving. They’re my favorite too Amy! Thanks! Yep I’m sold. Totally making this for Thanksgiving!! This looks AMAZING! Can you bake me one? (just kidding. sort of.) PINNED it! Bahahaaa! It’s in the mail ;) Thanks Bre! Holy cow… YUM! Not to mention, I am totally drooling over your pie dish. That is the prettiest dish ever! That looks amazing, Emily! You can’t ever go wrong with chocolate! This pie looks absolutely delicious! Thanks so much for sharing the recipe Emily. It is every bit as good as it looks Debbie :) Perfect for fall! Thanks! I’m late to this party, but would a dark or bittersweet chocolate work in this pie, you think? I find regular baking chocolate a tad dull/lifeless.